As promised several weeks ago, here are some thoughts about George Lucas in the light of the incoming release of Star Wars: The Complete Saga on Blu-ray discs. Then a special edition of the Star Wars trilogy came. It was an anniversary edition and although bringing some changes to the original movies, it was accepted rather warmly by the huge Star Wars fanbase, probably because it was just the beginning of the alteration process, the changes weren't so drastic or unpleasant and after all, George Lucas deserved to make a few additional bucks from his franchise. As an end result, the former fans were not really annoyed and the re-release produced plenty of new admirers of the series. It was similar to Anakin being a playful 9-year-old boy who accidentally became the "man" of the day. But the dark side of the force was already gaining control over Lucas. First, a prequel Star Wars trilogy was created. Although not being a disaster if considered independently of the original trilogy, it was far, far away from its virtues and in many ways spoiling the original movies' story and impact. But while completely unnecessary (except for money making) it still did not spoil the beloved films themselves. Then finally, the redundant altering of the original movies started with full force. DVD and Blu-ray releases came out and editing after editing happened. I won't enumerate all of the changes cause they are well-known but one of the recent edits (Darth Vader screaming "Nooooo!" in Return of the Jedi Blu-ray) seems to be a universal irritant all over the world. Fans are asking "How much can George Lucas alter ‘Star Wars’ before it’s no longer ‘Star Wars’?" or people acknowledge that George Lucas is just making Star Wars for himself and not for the fans or anybody else. There are 2 groups of people: the majority which is completely pissed off and the rest saying it's George Lucas' right to alter his creation as many times as he wants. Both of them have good arguments. But the root of "evil" in my opinion is that George Lucas knows the FANS are going to buy his altered versions anyway. It's easy to accept that Lucas is driven by noble motives (just like Anakin transforming into Darth Vader without having bad intentions). Let's agree that he wants to improve the imperfect Star Wars movies. We can put aside the money cause most likely the Blu-ray edition of the films would be even more profitable if released unaltered. So, if George Lucas thinks he is doing a good job editing the movies, it's forgivable. Of course, similar to legions of other fans, I do regard his anxiety for "perfection" as immature and childish, and possibly intensifying with age. The Star Wars movies have played their enormous role as released originally. There is no any need for alterations decades later and there is not any sensible reason for their creator to bother with possible "imperfections". To be troubled because of this is like being worried why you haven't won a gold Olympic medal with 3:1 score instead of 3:2 (only that Lucas case is worse cause in addition, people are against the changes too). The whole thing looks like a demonstration of "I'm the boss here, you won't tell me what to do!" although there is nobody denying the fact of Lucas' Star Wars ownership and there is nothing to be proved. 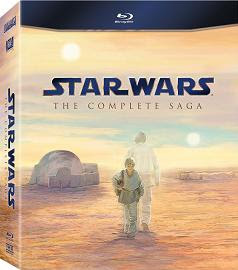 But as mentioned above, the main issue is fans are going to buy Star Wars Blu-ray edition no matter how crappy it is. Yes, people do not have a choice to buy the original trilogy on Blu-ray discs but they still have the choice to not buy Star Wars saga on Blu-ray at all. It is not a mandatory purchase. If George Lucas knew that the majority of potential customers would not buy any altered versions he wouldn't alter them. At least, not more than once. It would be a disgrace for him and a punch in his ego if nobody purchases those "improved" products. And he would stop with this madness. Finally, if he is doing all enhancements just for George Lucas, he could easily make a private copy (he has enough money to do it) without embarrassing himself with releases nobody buys. So, you do not have to purchase the Blu-ray releases. In the near future Blu-ray discs would probably be an obsolete technology anyway. Just wait until the alteration craze comes to an end and until then watch your older copies of the movies. And remember, it's hard to resist the dark side of the force, so continue to respect George Lucas despite his perfection mania as most of us respect Darth Vader (and to a lesser degree Anakin Skywalker) regardless of his dark force bias. I'll be the first to say that I refuse to buy the Blu Ray or the DVD releases. I like my movies how they were made originally. I'll stick with the VHSs.. unmolested.